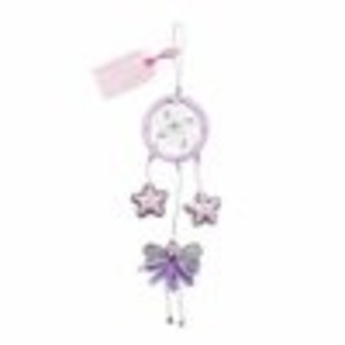 Gorgeous sparkly fairy dream-catcher with tinkling bell feet, beautiful beads and sequined stars which read 'catch good dreams and 'stop bad dreams'. A pretty alternative to a feathered dream-catcher to hang above a bed and encourage a peaceful nights sleep. Each dream-catcher has a poem attached which reads: 'Hang me above your bed and I'll catch your dreams for you - I'll magic away your bad dreams and make your good dreams all come true!' Size: 38cms when hanging. Supplied in an organza gift bag Not suitable for children under 3 years of age. By purchasing a Fair Trade product you are directly helping to provide better prices, decent working conditions, no child labour, local sustainability, and fair terms of trade to workers in the developing world. All 'Believe You Can' fairy items are made by fair trade producers in India who are approved by the World Fair Trade Organisation. 50% of their profits fund local community welfare projects in rural India including two schools, dentistry service and a health clinic.